Following the last post, based on the different Event Log ID’s across our super timeline we found evidence that someone used Remote Desktop to login into the system as Administrator. Moments after, the Administrator made a modification to a “svchosted” system service, changing it to interactive and running it. There is also evidence that this service crashed. Based on the time when all these events occurred we will look into other artifacts in our Super Timeline around the same timeframe. The leads that were obtained from Windows Event Log’s will facilitate the analysis of our Super Timeline going forward. This allow us to reduce the time frame and narrowing it down. Essentially we will be looking for artifacts of interest that have a temporal proximity with the event of the administrator logging in. The goal is to investigate further understand what has happened and what actions did the attacker did on our system. That being written, which artifacts should we look next? We will start with Prefetch. Let’s start with a brief explanation about Windows Prefetch. To improve customer experience, Microsoft introduced a memory management technology called Prefetch. This functionality was introduced into Windows XP and Windows 2003 Server. This mechanism analyses the applications that are most frequently used and preloads them in advance in order speed the operating system booting and application launching. On Windows Vista, Microsoft enhanced the algorithm and introduced SuperFetch which is an improved version of Prefetch. The Prefetch files are stored in %SYSTEMROOT%\Prefetch directory and have a .pf extension. The Prefetch settings that are enforced can be retrieved from the Windows registry key HKEY_LOCAL_MACHINE\SYSTEM\CurrentControlSet\Control\Session Manager\Memory Management\PrefetchParameters. You can read this setting easily with the brilliant tool created by Harlan Carvey called RegRipper and use the Prefetch plugin. On Windows XP and 7, there are a maximum of 128 .pf files. On Windows 8 this value can reach a maximum of 1024 .pf files. The file names are stored using the convention <executable filename>-<Prefetch hash>.pf. Worth to mention that this mechanism is disabled by default on Server operating systems. In addition there have been cases where SSD drives have this mechanism disabled. The internal format of windows Prefetch files have been documented extensively by Joachim Metz here. This documentation is part of libscca which is a library to access the Windows Prefetch File (SCCA) created by Joachim and can be used parse and read the Prefetch files from different operating systems. Matt Bromiley created a ready available script based on this library to read Windows 10 Prefetch files. 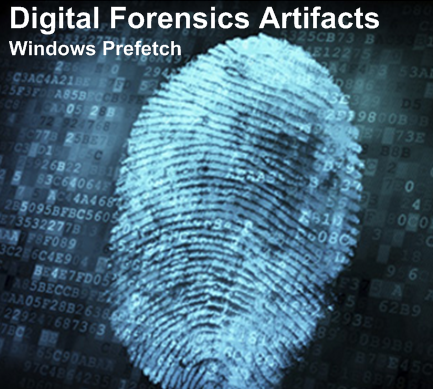 So, other than the Prefetch internals what is the forensic value of the Prefetch artifacts’? The answer is that the Prefetch files keep track of programs that have been executed in the system even if the original file is no longer present. In addition Prefetch files can tell you when the program was executed, how many times and from which path. Now that we have a basic understanding about Prefetch we will go back to our Super timeline analysis. Plaso supports Windows Prefetch events which we can be corroborated with FILE events and the Windows Event Logs. 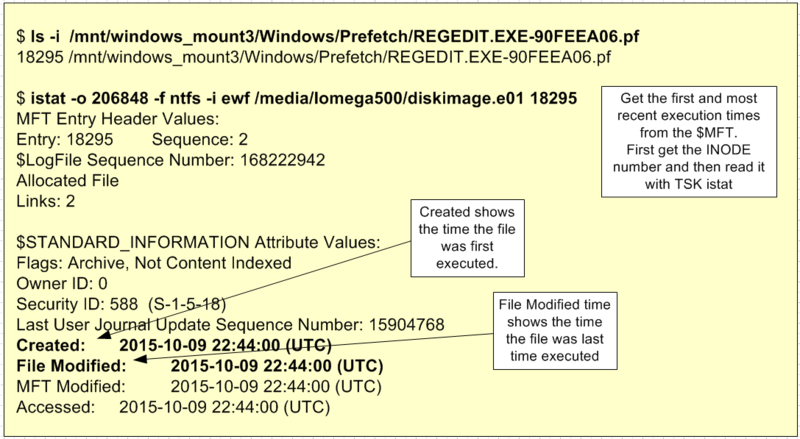 From the previous blog post analysis we were able to see evidence of when the Administrator logged into the system. And we know that when a user logs into the system, the initial Session Manager (smss.exe) creates a new instance of itself to configure the new session. The new Smss.exe process starts a Windows subsystem process (csrss.exe) and Winlogon process (winlogon.exe) for the new session. This sequence of Windows Events ID 4688 – you need audit process tracking enabled to view this one – can be corroborated with the WinPrefetch and FILE artifacts based on the temporal proximity. The picture below illustrates these events that were retrieved from the Super Timeline moments after the logon events. When combining the Events Logs, Windows Prefetch and File artifacts we start to bring together the different pieces of the puzzle and a start to form a picture of what happened. After looking at the result of the consolidated artifacts of interest in a single view and remove the noise we can conclude that: On the 9th of October, around 22:42:22 the user account Administrator was used to login into the system. The login was performed from a system with the IP 189.62.10.9 (Brazil). 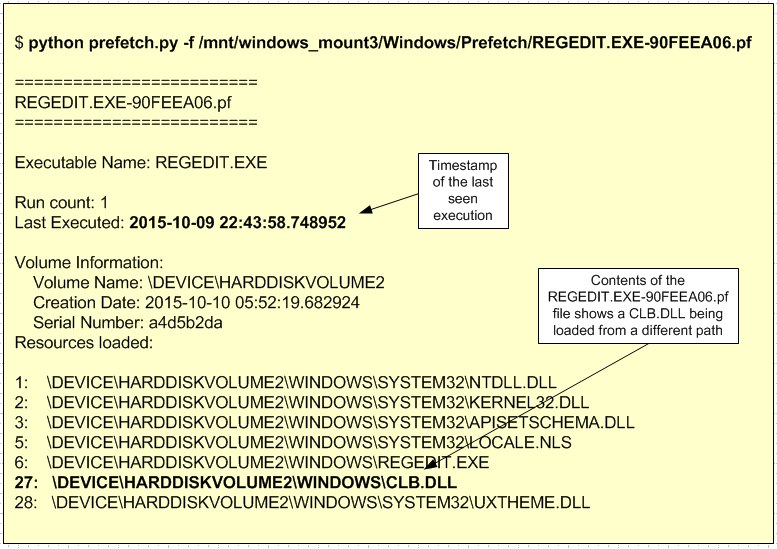 Then based on the Prefetch artifact we have evidence that the user Administration executed the application rundll32.exe following by regedit.exe. Next, the Windows system service FastUserSwitchingCompatibility service was changed and started. Finally a file cache.txt was created in the system. All this events are supported by evidence retrieved from our Super Timeline and can be shown in the following picture. Now, with the consolidated view of the different artifacts we continue pursuing the investigation and looking further into those prefetch files. To determine when was the first and the most recent time the binary was executed you can use istat from The Sleuth Kit to read the NTFS metadata entry for the file to get the timestamps. In addition, to the execution times, we still need to read the content of the Prefetch files itself. These are useful because in addition to the last execution and how many times they were run, it includes the full path and files loaded by the application in the first 10 seconds of its execution. An exception to this is the NTOSBOOT-B00DFAAD.pf which exists on all systems and keeps tracks of the files accessed during the first 120 seconds of the boot process. The full path and files are valuable because they might show evidence of files being loaded from different paths or invoking unknown binaries. To read the contents of the Prefetch files you could run strings with little endian encoding (strings -e l) as a quick and dirty method to view its contents. A more robust method would be o use Joachim Metz libssca and create a Python script to read it. For a readily available Python tool you could use Python script written by the researcher who uses as handler PoorBillionaire which is available here. In this case when looking at the Prefetch files from the regedit.exe we found evidence that regedit.exe invoked a DLL called clb.dll from a location that is not supposed to. This give us another lead to pursue our investigation goals. That’s it! In this article we reviewed some introductory concepts about the Windows Prefetch files, it’s forensic value and gave good references about tools to parse it. Next step, continue the investigation and review more artifacts’.